So in the previous posts we have discussed what derivative contracts are and some important terms related to derivatives. In this post we will discuss about the types of derivative contracts. Basically there are two types of derivative contracts. 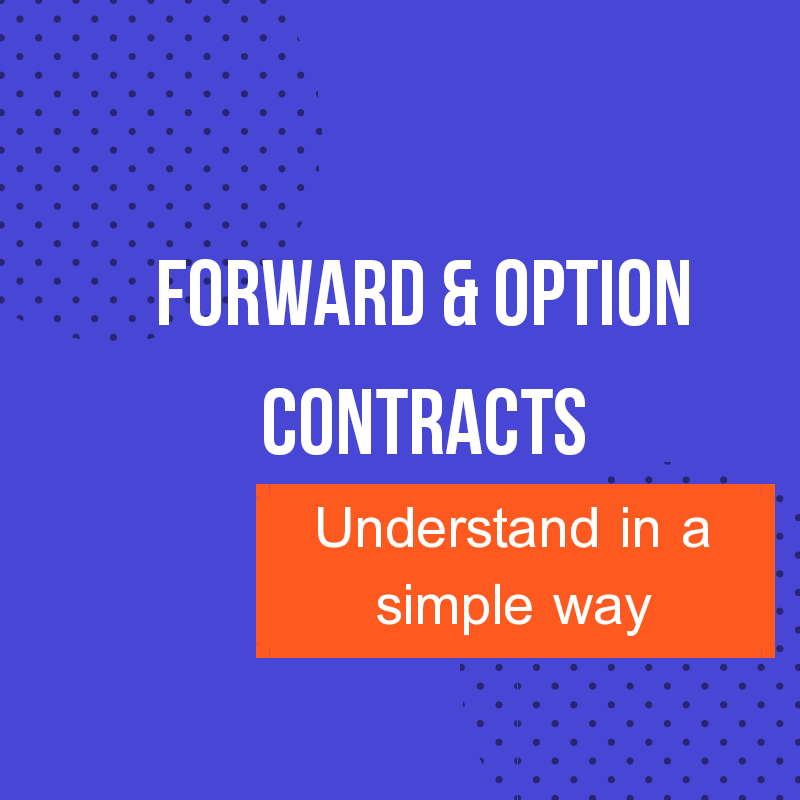 A forward or future contract is the simplest form of derivative transaction. Normally in this type of transaction there is an agreement to buy or sell certain quantity of underlying asset at a certain price on a specific date. No cash is exchanged while entering into the contract. Interestingly there is a difference between “no cash” and “margin money”. You have to understand that in forward contracts you must have required margin money in your account. But at the same time you don’t have to pay any cash out of your pocket for the contract. It is only the decrease of the price of the asset which will be debited from your ledger account. John enters into a contract to buy 1 lot of Asian Paints January Future contract @ ₹1400 on 1st January 2019. Here asset underlying is the shares of Asian Paint, quantity is 600 shares, and future date is the last Thursday of this month. Now as per stock exchange the minimum margin money for 1 lot of Asian Paint shares is ₹800000. So you are only eligible to enter into the transaction only if your ledger account has a balance of ₹800000 or more than that. But at the same time you are not paying anything to enter into this contract. Now, if next day the future price of the share decreases by 10 then John will bear loss of ₹6000 and this will be deducted from his account. Similarly, if the price of the share increases by ₹20 then you will gain a profit of ₹12000 and that will be credited to your ledger account. If the price of the share remains unchanged then you will gain nothing. This is the simple math. Now let’s take another example in which we will see a different application of forward contracts. Maya wants to purchase gold after three month but she is worried about the fluctuation of price in gold market. Hence she will buy 1 lot of gold today but the future date will be after three months. So if the gold price increases then she will gain a profit. But if the gold price decreases then she will bear loss. The very simple meaning of option is the process of choosing between alternatives. So what are the alternatives in stock market? Answer is “to buy or not to buy, to sell or not to sell”. 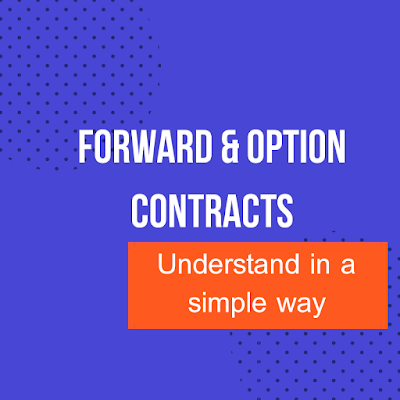 So option is a contract where the buyer of the option contract acquires a right to buy or sell a specific quantity of asset underlying on a specific date at a specific price. One major difference between forward contract and option contract is the premium paid. As we have already discussed that there is no need of cash in forward contracts but in option contracts you have to pay cash which is known as “premium” in stock market. This is the price you are paying to acquire a right. After acquiring this, you have the option to invoke the contract or just ignore it and it will lapse. Let’s understand it by an example. Sania bought 1 call option at the strike price of ₹1400 for January series. She also paid premium of ₹10 to acquire this contract.Now three outcomes may come. First if the share of Asian Paint went up to ₹1450, then Sania will exercise her contract and buy the shares @₹1400. In this case let’s understand the cash flow from Sania’s point of view. Now let’s come to the second outcome where the price of the share is decreased to ₹1350. In this case Sania will not exercise her option to buy the shares. So cash flow will be as under. And the third outcome where price of the share remain unchanged then it is upto Sania, whether to exercise or not exercise the option. So in this way option contracts work. Basically option contracts are used for hedging purposes. In simple terms big companies use this like insurance. We will discuss it in our coming blog posts. Till then stay invested, stay happy.